A Rescue Rangers movie will bring the animated chipmunks to the big screen in a live-action/CG hybrid film. Get ready for a wave of nostalgia. The Hollywood Reporter has revealed that Disney is reviving Chip 'n' Dale with a feature film. The film is expected to be a live-action/CG hybrid, in same vein as the recent Alvin and the Chipmunks and Smurfs movies. Robert Rugan, award-winning commercials director, pitched an updated take on the detective chipmunk duo to Disney. Mandeville Films/TV, the studio behind the Muppets films, will produce the Chip 'n' Dale film. Chip 'n' Dale have been around in Disney cartoons since 1943. The pair got a television show in 1989, titled Chip 'n' Dale Rescue Rangers, which put them in charge of a detective agency. Along with Australian mouse Monterey Jack, his sidekick housefly Zipper, and mechanic mouse Gadget Hackwrench, Chip and Dale solved crimes for their animal clientele. 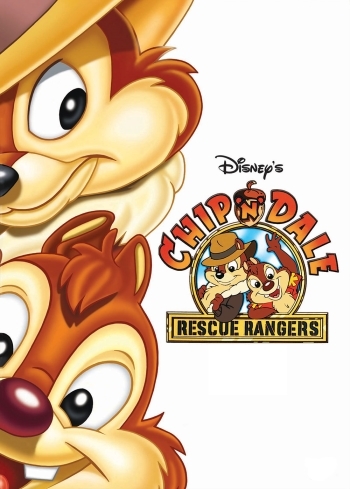 Chip 'n' Dale Rescue Rangers ran for three seasons alongside DuckTales, TailSpin and Darkwing Duck. The show ran in syndication on The Disney Channel for ten years. In 2010, the chipmunks returned in a short-lived comic book series from BOOM! Studios. The new film will draw on Chip 'n' Dale Rescue Rangers, telling an origin story for the chipmunks. Live-action/CG hybrid films have been doing well, so it's easy to see why Disney would join the fray. Fox is on its fourth installment in the Alvin and the Chipmunks series, and Sony Pictures Animation has produced two Smurfs movies. Personally, I find the combination of live actors with CG animals a little off-putting, though I imagine photorealism wouldn't make the films look any less strange. Listening to the old theme song delivers a hard hit of nostalgia, and has me hoping that the film will be more than just a grab for some of the live-action/CG market share.